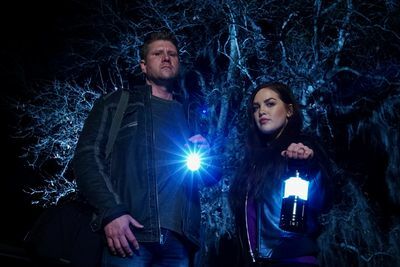 NEW YORK (March 12, 2019) – Paranormal pioneer Bob Magill and empathic investigator Tina Storer take on frightening, personal hauntings in America in the cult classic “Ghost Bait,” lured back to television and premiering on Travel Channel on Thursday, April 4 at 10 p.m. and 10:30 p.m. ET/PT with 12 half-hour episodes. Using a shocking but effective method of isolation combined with sensory deprivation, the duo helps people overcome their fear of intense paranormal activity. After conducting their own paranormal investigation, Magill and Storer use their findings to elevate a client’s fear level and then use that terror as bait to draw out the entity and force a confrontation. By facing their worst fears head on, Magill and Storer believe the living can overpower the negative forces around them to reclaim their sense of peace and control.